Journal of Thyroid Research is a peer-reviewed, open access journal that publishes original research articles, review articles, and clinical studies in all areas of thyroid research. Thyroid.org: Research The American Thyroid Association, Clinical Thyroidology for Patients is a collection of summaries of recently published articles from the medical literature that covers the broad spectrum of thyroid disorders. Radetti G et al. The natural history of the normal/mild elevated TSH serum levels in children and adolescents with Hashimoto's thyroiditis and isolated hyperthyrotropinaemia: a three year follow-up. Moon et al. A taller-than-wide shape in thyroid nodules in transverse and longitudinal ultrasonographic planes and the prediction of malignancy. Castro MR et al Predictors of malignancy in patients with cytologically suspicious thyroid nodules. 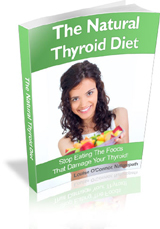 Are you struggling with an underactive thyroid? Written by a Naturopath and wellness coach who has helped thousands of patients.